Looks like theirs a new bundle/ Nintendo DS Lite coming to America. Nintendo has found a way for people to exercise both their fashion sense and their minds at the same time. 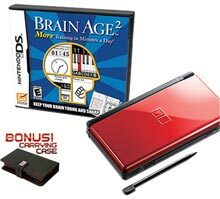 The first new color scheme to hit the hot-selling Nintendo DS™ system in the United States in nearly a year will come bundled with Brain Age™ 2: More Training in Minutes a Day, all at an MSRP of $149.99. The bundle hits stores Aug. 21. The top half of the new Nintendo DS sports a smooth, glossy Crimson, reminiscent of a dangerous shade of lipstick or a cherry-red sports car. The bottom is a matte black – an Onyx yin that complements the Crimson yang. Brain Age 2: More Training in Minutes a Day is the sequel to the smash-hit original that got baby boomers and seniors playing and redefined the concept of what video games could be. This new title includes 15 fun new activities designed to help users exercise their brains. It challenges players in areas like math, memorization and even music. The original Brain Age: Train Your Brain In Minutes A Day has sold 8.61 million worldwide, including more than 1.4 million in the United States alone, while its sequel has already posted sales of 5.33 million in Japan. For more information about Brain Age 2, please visit www.BrainAge.com. This entry was posted on Tuesday, August 7th, 2007 at 6:26 pm and is filed under Nintendo. You can follow any responses to this entry through the RSS 2.0 feed. You can leave a response, or trackback from your own site.